Rotterdam-based producer Christopher Yikes specialises in the deeper sounds of Dubstep. Borne out of a very musical family with Moluccan roots, he followed the tracks his progenitors laid before him through rehearsals and instru- mentation at a very young age. Not long after he found himself favouring turntables over the guitar, Christopher Yikes was already dabbling in music production and all the benchmark extracurricular activities of a music-loving teen- ager. 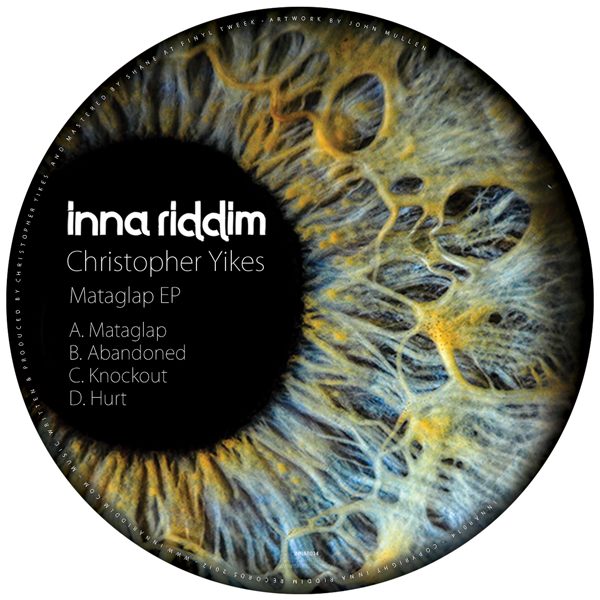 Progressing through the genres to hone his skill set it wasn’t until 2009 that he turned his attention to Dubstep and has been hooked ever since, whilst always drawing inspiration from the heyday of techy DNB in the late 90s/early 2000s (an era that we here at Inna Riddim are particularly fond of too). Today Christopher Yikes is focused and working harder than ever; a clear determination that came across upon our contact and through his impressive Mataglap EP. His resolve to bring a unique and tailored flavour to the colour- ful spectrum that is Dubstep is clearly evident through his recent successes: his debut Mataglap EP a proud statement of intent, and testament to dreams and aspirations in reach. One to watch! ‘Mataglap‘ is chillingly filmic: walking down a dimly-lit corridor in an abandoned asylum, shapes lurking in the doorways, a bassline unfurling like dry ice across the floor, echoes of percussion from distant chambers, while clipped snares echo in deserted halls. A muted and delayed vibraphone picks out a eerily descending note sequence, while snipped vocals stutter from a malfunctioning announcement system; is that a second pair of foot- steps, a menacing figure in your peripheral vision? Pure cinematic atmosphere. ‘Abandoned‘ projects Yikes’ spectral style onto a much bigger canvas: a giant warehouse or, better, a great ocean liner – not wrecked like the Titanic but intact and mysteriously vacated like the Marie Celeste, left to steam ahead under its own power, undergirded by massive subsonic propulsion interlocking with a kick drum pounding out a broken techno-dubstep 4/4 rhythm, surging forward through an ocean of reverb, while heavily processed keys play a fragmented lament for the vessel’s lonely cybernetic soul. Half-submerged vocal samples echo for a moment and then are smudged out. Distortion isn’t used here in the game of midrange one-upmanship that has poisoned main- stream dubstep, but as a deliberate and delicate effect that offsets the crispness of the other sounds. ‘Knockout‘ is the most energetically upfront track on the EP: a halfstep rattles from a juddering kick to a snare that hasn’t quite faded away when the next one replaces it. The rasp of a sawtooth bassline is the writhing spine on which the track’s nervous system is centred. Yikes has sacrificed none of the attention to detail or atmospheric tension that mark his tracks out; and the ghosts are still present in the machine; drips from leaking faucets, and whispers of shakuhachi. But the title hasn’t been chosen for nothing: this is the one that’ll slot most naturally into a set for the dubstep dancefloor. ‘Hurt‘ soars skyward on a vast membrane of unbroken bass pressure, undulating arrhythmically, punctuated by the snapping syncopation and plosive hits of a future-garage beat. After a whispered coda in the middle of the tune, little swirls of sound like a melancholy serenade across the darkened floor of a derelict arcade from one broken coin-op to another, blinking their lights with a little stray electric current. Then the bass spirals back, phas- ing into time with the beat and then out again. It’s expansive yet delicate; intimate, distant and full of regret.